Students preparing for the radio play. Prisoner 4099 was created and performed by history, drama and music students at RNIB New College Worcester and young people from LOOK, The National Federation of Families with Visually Impaired Children. As well as a cast of over 25 young people, a number of voluntary and support staff helped behind scenes. 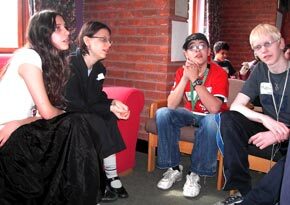 The play was recorded by Youthcomm Radio, a project of Worcester County Council. Hello everyone. My name is Lucy and I am from LOOK. The role I am going to be playing today is a journalist who is interviewing William Towers. He is an old man on his deathbed and I will be asking him to reflect on his past. My favourite thing about The National Archives is the fact that we were able to look at documents that you'd never usually see. We saw the Domesday Book and got to hold an exact replica. I think the best bit about the visit was the actual performance. It was good to have the chance to get up and perform as a group.